Congrats! Your son is now a Delta Upsilon. Here are some things we think you should know to help him have the best DU experience. Greetings from Indianapolis, home of the Delta Upsilon International Headquarters! Your son has made an important decision and has joined the DU chapter at his university. We are sure you have some questions about the organization and the impact it will have on his life, both while in college and beyond. On this webpage, we highlighted some information and resources to allow you to easily access what you need to know. You can also browse our full website to learn more. Delta Upsilon wants you to know that we are committed to helping your son be successful, and we wish to partner with you in this effort. We recognize the vital role parents/guardians play in supporting their student’s education. Together, we can prepare your son for success through Delta Upsilon's mission of Building Better Men. Welcome to the DU family. 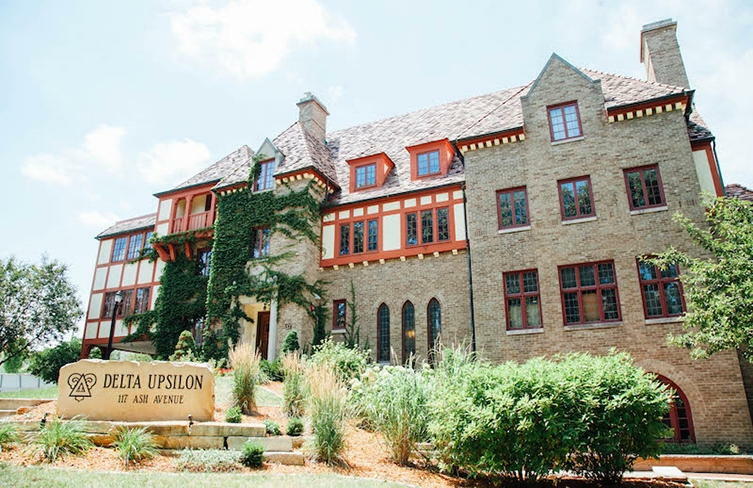 Delta Upsilon is North America's sixth oldest fraternity and oldest non-secret fraternity. Founded on Nov. 4, 1834 at Williams College in Massachusetts, DU has always been an organization that seeks to promote and advance justice while creating valuable learning and personal development experiences for men. Our mission is Building Better Men and our vision is to be the premier men's fraternity that prepares our brothers for a global society through service, leadership development and lifelong personal growth for our diverse membership. Simply put, DU helps build good men who are difference makers. The experiences we offer are relevant and better prepare men for the world than the typical college experience. A college education prepares men for their careers. Delta Upsilon prepares them for life. As a Fraternity, Delta Upsilon frames everything we do around our Four Founding Principles. We need men of character who promote friendship and well-being, who recognize and celebrate what makes each of us different and unique. Above all else, we need men who are committed to the advancement of justice. Since our founding, Delta Upsilon has been a non-secret fraternity. What that means is that all our Rituals and governing documents are open to the public. Most fraternities and sororities keep these items private — for members' eyes only. However, Delta Upsilon believes in transparency. How could we let people know the true value of membership and what we stand for if we were to keep our most important documents secret? As your son moves forward in the DU experience, we invite you to learn more about our Ritual and governing documents. Please talk to your son about important events, such as his Initiation. You are invited and encouraged to take part in that momentous occasion. Delta Upsilon offers a number of educational programs that teach practical leadership and life skills. Designed based on the needs of undergraduate brothers and rooted in our Four Founding Principles, these programs build stronger leaders, better men and stronger chapters. 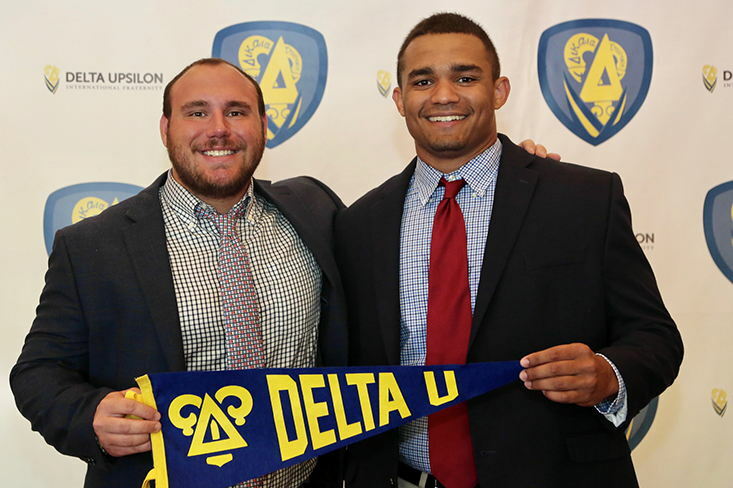 Delta Upsilon's educational programs have a proven track record of success and have won numerous awards from professional fraternity/sorority associations, as well as groups like the American Society of Association Executives (ASAE). Your son will take part in a number of educational programs at the chapter level that will help him reach his potential. We want to highlight a few of those programs for you. Every DU participates in the Fraternity's standardized Associate Member Education Program after he joins. This award-winning, eight-week program introduces new members to the Fraternity, providing information on DU's history, Four Founding Principles, operations, local history, team building, leadership success and more. This program creates a hazing-free environment that helps men learn how to connect with one another and the DU brotherhood in a positive, safe environment. Every new DU is also asked to take GreekLifeEdu. This science-based course aims not to preach, but rather to teach the facts about alcohol, hazing and sexual assault. It empowers members to make well-informed decisions and provides simple strategies to keep them and their friends safe. This course must be completed prior to his Initiation. 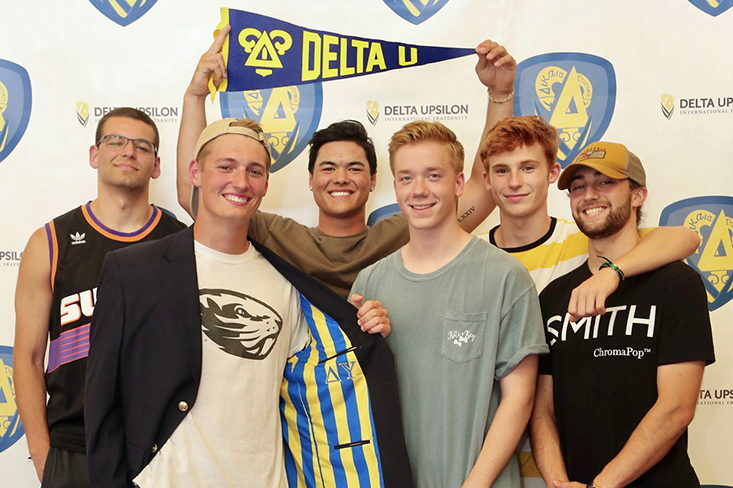 Delta Upsilon offers several international programs that bring together DUs from across North America to learn from trained Fraternity staff and volunteers about a variety of topics. Some programs (like Presidents Academy, Regional Leadership Academy and Recruitment Symposium) offer support and training for chapter leaders. Other programs (like the Leadership Institute and DU Emerging Leaders Experience) feature a broad range of educational offerings that benefit all members. Delta Upsilon's international service project and philanthropy is the Global Service Initiative. Every DU chapter raises money for GSI, and the Fraternity offers three GSI service-learning trips per year. On these trips, brothers travel to Jamaica for a week of hands-on service and values reflection. This award-winning program is a first in the interfraternal community and prepares students for success in an ever changing and growing global environment by developing global awareness and cultural competencies. Delta Upsilon knows you want your son to have a positive, safe experience. We do too! Loss Prevention is what Delta Upsilon calls our policies, education and strategies around the wellness and safety of our members and guests. This includes policies regarding alcohol and drugs, hazing, sexual assault, fire, and more. “Prevention” is the key word in our Loss Prevention model. Opposed to being reactionary to problems as they occur, we want to prevent them from happening in the first place. Upon joining Delta Upsilon, your son will be asked to read, understand and uphold the values and policies of the Fraternity. He is also asked to uphold university policy, as well as local, state/province and federal laws. If he fails to do, please be aware his chapter may intervene in a variety of ways dependent on the situation and past behavior. If necessary, the International Fraternity may also get involved. Our goal is to identity any problematic behavior, address its causes, and hold chapters/brothers accountable if needed. Rest assured that hazing is in no way tolerated in our chapters. As we build better men, we aim to do so in environments that are safe, welcoming and positive for members. Delta Upsilon is dedicated to creating environments for members to learn, grow and thrive. 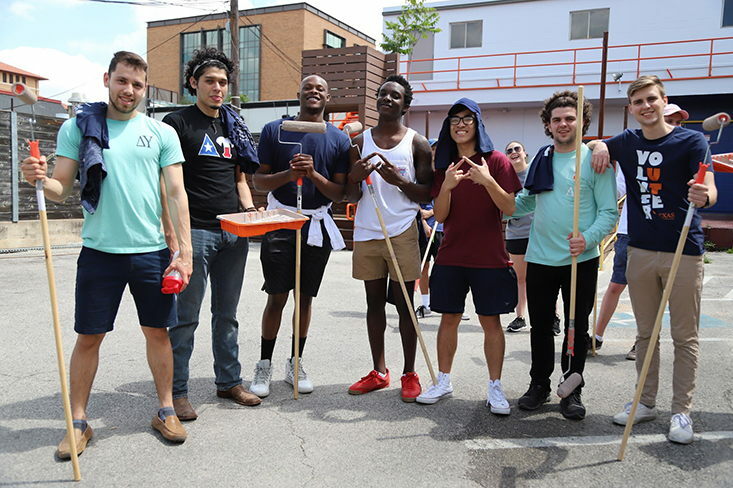 As such, Delta Upsilon announced that in fall 2020, all DU housing will be substance-free. This means no alcohol or other substances will be allowed to be stored or consumed within DU chapter facilities, regardless of a member's age. This includes traditional, stand-alone fraternity houses, university-managed suites, etc. In fall 2018, all hard alcohol was removed from chapter housing. We believe it is important for you as a parent to understand this policy. Your influence will go a long way in helping your son understand the importance of this policy. Each year, about 85-90% of members living in DU housing are under the age of 21. Removing alcohol from our facilities sends a clear message about Delta Upsilon’s purpose, values and our commitment to make campuses safe for all students. Please be aware that chapters can still host events with alcohol at offsite events (including formals and other social functions) provided all drinks are served by a third-party vendor only to those above legal drinking age. These events must follow all other DU and university policies, as well as the law. Delta Upsilon staff is currently developing resources to help chapters prepare for this policy to take effect. Chapters are also receiving individualized assistance in creating action plans that will work in their chapters and their campuses. You can learn more about the substance-free housing policy and view our resources on this website. 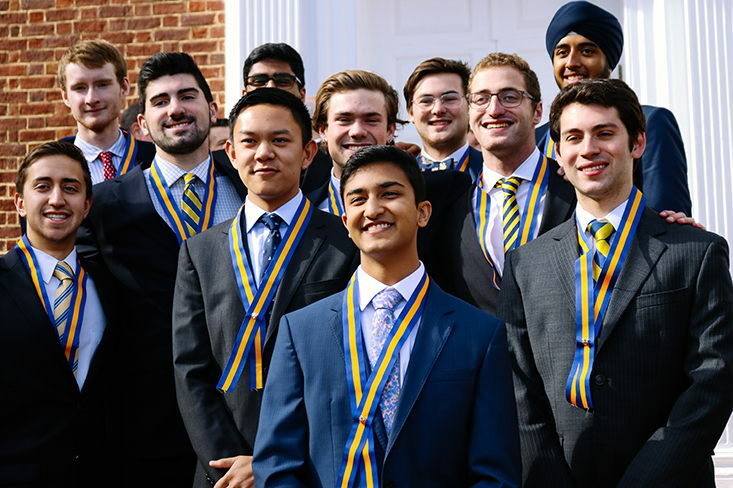 Delta Upsilon has chapters across the U.S. and Canada. For a full list of chapters, click here. Each chapter is an extension of the International Fraternity with the same mission, Principles, beliefs and governing policies. However, each chapter has a unique history and set of traditions based on campus culture, geographic location, chapter size, whether it is housed or un-housed, and more. As such, individual chapters may have varying local philanthropies and activities specific to their community. Chapters can also have their own set of bylaws that are in addition to the International Fraternity's Constitution & By-laws to address specific needs and concerns of the chapter. As a parent, it is important for you to understand what things are managed by your son's chapter and not the International Fraternity. Delta Upsilon trains its chapter officers, advisors and alumni volunteers about best practices and Fraternity policy. However, should questions or concerns arise, depending on the issue, different entities will be your best resource. If uncertain of who to contact, always ask your son. You can also contact the International Fraternity at ihq@deltau.org or (317) 875-8900, and staff can help or point you in the right direction. *Please note that while Delta Upsilon is a non-secret Fraternity, we also respect our members' privacy. Because your son is an adult and made the personal decision to join DU on his own, there are some pieces of information that may not be shared with you without your son's expressed consent. This may include specifics about dues/finances, member conduct issues, and more. Each semester, your son will be assessed dues and work with his chapter to pay those dues. These dues are based on International Fraternity dues amounts each chapter owes, as well as the chapter's individual budget. Chapters create their budgets and dues structures each year with guidance from the International Fraternity and volunteers to be unique to that chapter's housing situation and chapter activities. This means, that depending on which chapter your son joins, his dues may be more or less than those from other DU chapters. All dues collection for your son will happen at the chapter level. If you have questions about dues, finances or the possibility of a payment plan, please have your son put you in contact with the appropriate person in his chapter. Delta Upsilon's dues structure is one of the most competitive of all fraternities. All DU members and chapters are obligated to uphold all DU policies (International and local); university polices; and all local, state/province, and federal law. When these obligations are not met, intervention and/or accountability actions may take place. Each chapter is expected to self-govern and hold members accountable within the confines of International Fraternity policy and procedures. When the need arises, conduct issues may be taken up by the International Fraternity's Judicial Committee. At both the local and international level, DU's aim is to provide support and assistance to the chapter and/or any member involved. Sometimes, universities will sanction chapters or members for alleged misconduct. In these instances, the International Fraternity will work to partner with the university to investigate and address concerns as they arise. Please know that when it comes to member conduct, DU aims to share important information with you while also respecting members' privacy and legal rights. Various housing types exist within Delta Upsilon. Some have traditional, stand-alone houses. Others have housing provided by the university or rent from a private landlord. Others may simply have a "suite" or meeting room on campus in which to gather. While the International Fraternity does have housing policies and guidelines all chapters must follow (like the substance-free housing policy mentioned above), it does not own any chapter housing. DU housing is either owned and managed by a local alumni corporation or the college/university. If you have questions about housing contracts, invoices, etc., please contact either the alumni corporation or your son's institution (whichever manages the property). If you have health or safety concerns regarding chapter housing, please also contact the International Fraternity, as we can help intervene in these situations as appropriate. The health and safety of members is our highest priority. The DU Educational Foundation is a separate 501(c)3 organization that is able to accept tax-deductible gifts. As parents, we invite you to join us in Building Better Men. Your gifts will help fund the programs, scholarships and initiatives that create strong, lifelong leaders and global citizens. Through the Foundation, you can give directly to funds supporting your son's chapter or to the Annual Loyalty Fund, DU's general Foundation fund. The DU Educational Foundation also provides 10 McQuaid Scholarships each year that help brothers fund their undergraduate or graduate degrees. Encourage your son to consider this opportunity. Now that your son is a Delta Upsilon, he will likely be excited to show off his new letters! DU works with a number of vendors to provide quality DU merchandise and protect DU's trademarked names and logos. Visit our Shop page to find items available to purchase from the International Fraternity or to find a licensed vendor. Delta Upsilon has a number of publications and resources available to help you learn more about the Fraternity. The DU Quarterly is Delta Upsilon's member magazine, and your son will start to receive it upon his membership. You may receive this magazine at your home if your son lists it as his home address. You can also read the DU Quarterly online. The Cornerstone is DU's member manual. Each new member receives a copy of the book when he joins the Fraternity. It provides information on DU's history, policies and more. Want to receive important updates from Delta Upsilon International Fraternity? DU regularly provides updates to parents about news and initiatives on the international level. The DU Educational Foundation may also contact you about giving opportunities. Make sure you are on our mailing list! You can also utilize these online forms to connect with DU.